Dayton, Ohio-Fifth Third Bank and the Dayton Dragons have partnered with the The Foodbank, Inc. in efforts to assist families fighting hunger in the Miami Valley. From April 28-May 1, from 5:30-7:00 p.m. on the plaza at Fifth Third Field, donations of canned goods and non-perishable food items will be accepted. Items will be donated to The Foodbank, Inc. to provide meals for those in need. "Each Fifth Third Day, May 3rd, Fifth Third and our employees celebrate our commitment to our communities and to fighting hunger," stated Doug Compton, Fifth Third Bank's Dayton City Executive. 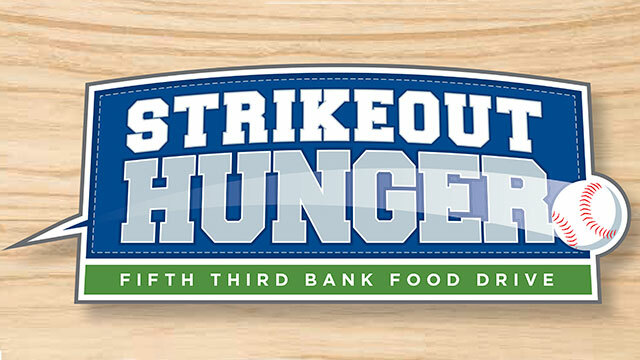 "Through volunteerism and donations, we're proud to partner with the Dayton Dragons and their fans in support of The Foodbank, Inc. and efforts to Strike Out Hunger." Michelle Riley, CEO of The Foodbank, expressed the need for the donations. "Throughout our tri-county region, our member hunger relief charities serve about 16,000 meals every day to children, families and seniors," she said. "We cannot respond to the enormous need for food assistance without the generous support of community partners like Fifth Third Bank and Dayton Dragons."